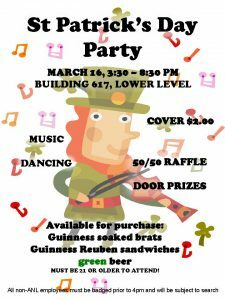 St. Patrick’s Day Celebration on March 16th at the Exchange Club (Bldg.617)! Posted in Announcement	| Comments Off on St. Patrick’s Day Celebration on March 16th at the Exchange Club (Bldg.617)! Chicago Bulls vs. Houston Rockets United Center, Fri., March 10 at 7:00 p.m.
Chicago Bulls vs. Utah Jazz United Center, Sat., March 18 at 8:00 p.m.
Posted in Announcement	| Comments Off on ARGONNE NIGHTS WITH THE BULLS!